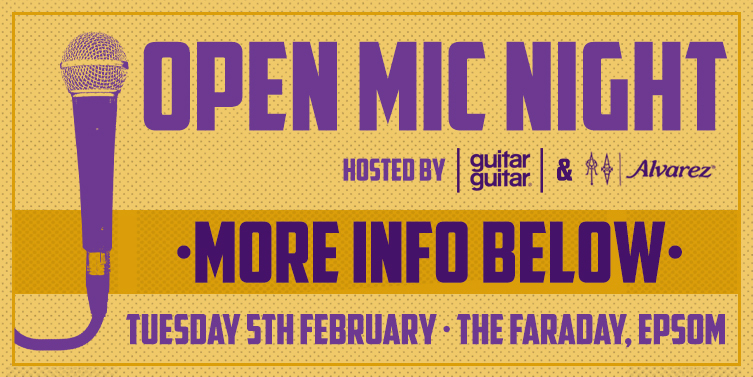 It's a new year and that can only mean one thing, it's time to for the guitarguitar Epsom Open Mic night to kick off again! Yeah, we're sure you've all had a lazy festive period and are slowly adjusting to being back at work but that's no excuse for not picking up your trusty acoustic and having a strum. Failed New Year's resolutions aside, we know that you'll be as excited as we are to get back into the swing of things and rejoin the crew to play some old favourites and maybe even show off some of the new songs you've written or learned over Christmas! In association with Alvarez guitars, we're back at the Epsom store's local pub, the Faraday, on Tuesday 5th February (05/02/19, 7:00PM) for another celebration of local talent. Whether you're a budding songwriter, part of a covers duo, or just love playing guitar, we want to see and most importantly hear what you've got to offer! These events always have a very laid back, friendly atmosphere and there really is nowhere better to have some fun playing live in a chilled out atmosphere. So, if you feel like breaking in the new year by stepping up on stage, get in touch to reserve your space now and join us for what we already know is going to be another fantastic evening of music. All performers are welcome to bring their own instruments along but if you fancy trying something different, we'll be armed with a selection of our favourite Alvarez acoustics for you to try out! Please note, this is an 18+ event.